I stole this name from Green Up goddess, Nicholette von Reiche. Well, actually her husband came up with the name. The other day he mentioned how a smoothie he made tasted like something you would get at a spa…cleaning you from the inside out. Light bulb! 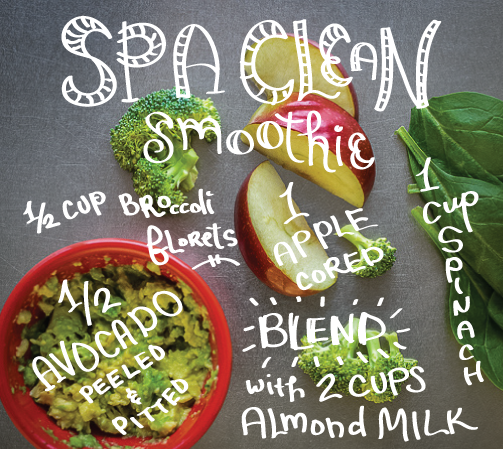 I had a tough time thinking of a good name for today’s drink and since broccoli is the main ingredient, “spa clean” certainly makes sense. 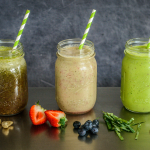 Why put broccoli and spirulina in a smoothie and what does it have to do with a spa? 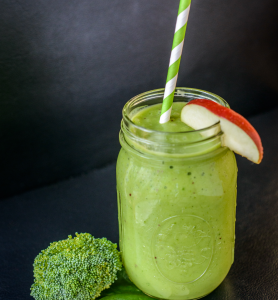 Broccoli nourishes not only the skin but also the joints and connective tissue around the body to help you move without pain and aging. Broccoli is a nutritional power house. Packed with vitamin A (smooths the skin), iron, calcium, zinc, magnesium (great for sleep), potassium, and chromium, not to mention full of phytonutrients (essential to keep you alive) and antioxidants. The anti-aging benefits are huge…broccoli eases inflammation, fights free radicals which dull the skin and help purge the body of toxins. 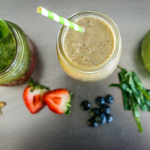 And when you add the boost of super food, spirulina, you have a detoxifying drink. The spirulina, blue green algae, is a complete protein essential for life. It boosts your immune system, alkalizes your blood (meaning eases inflammation), and pretty much detoxifies all your organs, especially the liver. See, broccoli + spirulina = spa clean. Go ahead and make it. 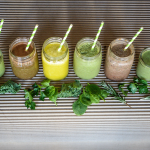 Have you ever heard of spirulina? If so, what smoothie creations do you make with it? Recipes, please!